Master Ma Yue has a long and illustrious career in the martial arts. He was born into a family famous for its martial arts, one that has helped to shape their development in recent times. Not only does he have his family's skill behind him, he is a graduate in Wushu of the Peking Sport University, the most highly regarded Sports University in China! And, if this is not enough, he was twice Chinese National Wushu Champion. Now a resident in the UK, Master Ma has been working hard to develop the many different things he has learnt over here. Qi Magazine: Could you tell us how you got involved in martial arts? Ma Yue: I started when I was six with my father. That was in 1966 in my own Family style called Tongbei, andBaji, Fanze and Piqua. QM: So your family have a strong history in martial arts? MY: Yes, from my grandfather. My grandfather and my father were both famous martial artists of their generations. My father has been teaching martial arts and physical education for 35 years and in the last three or four years was made one of the top ten martial arts professors in the whole of China by the Chinese government. This year he told me he has been recognised as one of the most famous martial artists in the world. QM: How did martial arts actually come about in your family, how did your grandfather come to learn them? taken in as a student. But all his life he has developed his Tongbei, Piqua, Fanze and Baji to a very high standard. On top of that, my father, in his time, made these martial arts very popular throughout the whole of China. He made the Tongbei style popular by teaching at a sports university for martial arts and wushu education. At the same time he taught the professional wushu team, and from that time, Piqua, Fanze and Tongbei slowly became popular. Now all the wushu players use them in competitions. In the 80's through to the nineties all the top wushu men followed them, people like Jet Li, Zhou Chanjing, Li Qijou and Tu Fangliang. During this time you could call these people the Wushu Kings and Queens of China. Jet Li, as we all know, was five times champion and the others won many championships, although outside China people may not know their names, in China and in the Wushu world everybody recognises them. That is why Tongbei is so popular as all these top people used my family style. QM: What are the origins of Tongbeiquan? MY: There are many different styles of Tongbeiquan in China and a lot of people confuse my family's Tongbei with other styles. I think you understand how martial arts develop. They are like a tree. If I am the first tree, the original, then there are no others. The original Tongbeiquan was created by martial artists who had a great deal of experience of the philosophy of the fighting side. They also used a lot of animal movements, like the monkey. They watched the monkey way of moving, how it moved its arms, how it moved its back. So that is the original Tongbei style. At first, if I am the only one doing it, then there is only one Tongbei, but if I have lots of students, once they graduate, they start to go their own way and follow their own understanding of the skill. On top of that, maybe they learn different martial arts and so they will develop in a different way. So over the years their Tongbei develops in a different way, at another angle, and this is why there are other forms of Tongbei. My family's Tongbei is different and unique as it has Baji, Piqua and Fanze and Chorjiao - the kicking. Chorjiao is very rare and not many people in China know the real Chorjiao very well, but my grandfather's knowledge is very good. So in China my family's Tongbei is known as Ma's Tongbei. If you say this in China people will know which Tongbei you are talking about. Tongbei originated around Tanzhou, it goes back many, many years over many generations, but what the actual original Tongbei was, I don't know. Every style developed from natural fighting - fighting with people or animals. With time people acquire experience and knowledge and that's how all martial arts started, whatever the style. QM: How did you come to be in England? My: That's a long story. I came to England to study English and see with my own eyes the Western way of life. I also thought I could promote and develop martial arts in the West. But it has not been as easy as I thought. A lot of things are different. QM: So what is your emphasis now? MY: To be honest all these years I have lived in the West, I've found that my knowledge of martial arts is too much for the Westerners basic interest. It is too much above what they want to know. If I talk to Chinese people who have been interested in martial arts for many years, they will be interested to listen to me, but if I talk to some body with only two years or, even ten years, of Karate they wouldn't understand what I'm talking about. 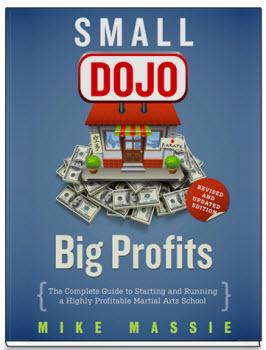 So I am planning a simple way to promote martial arts. My aim is to keep as much of my knowledge as I can, waiting for the day when I have people who have achieved a high stage who will say "I want to talk about real martial arts with you and learn real martial arts from you." But before I can achieve that I have to bring myself down and teach very basically. I could teach self-defence, maybe people want to enter a kickboxing competition or maybe a basic Chinese wushu foundation to start with. I am also interested in developing health and promoting taiji. 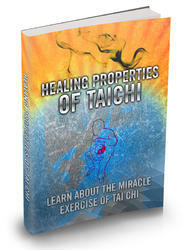 I can see the potential in taiji and I am happy to help people improve their health. It is a good thing to do, so from now on I will concentrate on the taiji side, but I will not leave other skills aside. I will try to do both. QM: So how is it going? Are you getting there? MY: I've been doing a lot of things throughout my years in England and I have only been concentrating one hundred percent on martial arts for the last four years, with an emphasis on taiji. In 19941 established my 'Level 1' taiji students. In 19851 demonstrated in Birmingham at the National Exhibition Centre. In 1996 my teaching commitments increased and the number of students loyal to training with me has got bigger and bigger. In 1997 I was invited to Washington DC to attend a World Conference by the World Federation of Martial Artists as a representative of international martial artists.. More recently, in 1998 I have started as resident taiji instructor at the Springs Hydro Health Farm. Taiji students at level 2,including an English student, Mr. Steve Croghan, have been trained to teach taiji introductory courses on my behalf. One of my ambitions this year is to produce my own English instructional video. QM: Do you have your own gym? MY: No, not yet, but I would love one. As far as I can see it is hard to make a living just teaching martial arts. Ideally I need a sponsor, so until one comes forward I have to look at other ways of promoting taiji and martial arts. For example if I get a chance to get back into the movie business then I will. I was involved in the movie business for four years in China. Also if I get a chance to make a TV. series then I will. There are actually a lot of ways to promote the martial arts, I don't think I will be teaching for the rest of my life. QM: Do you find that teaching is the hardest way? MY: Yes, it is a hard way because you are like a farmer. If you want to grow a tree you have to plant a seed and look after it for many years until you have a real tree. That's what teaching is, the students are like trees. At first they know nothing about what they are doing, until they grow. Its tough and there is a lot of responsibility. The best way is to take care of everything, take care of your teaching and keep it going and look for something else. If you can do that, then it is good. QM: You mentioned you studied taiji at university, but didyou study any with your father? MY: I didn't learn taiji from him, but he taught me Tongbei Qigong. 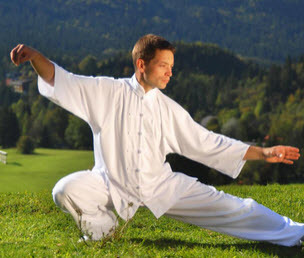 A lot of martial arts have their own Qigong exercises. This is because a lot of styles are physically very tough and so they need something to relax them and balance themselves. Also in old times people fought a lot, maybe in competitions or outside. So Qigong helped them to release the pain and also build themselves up to withstand the blows. 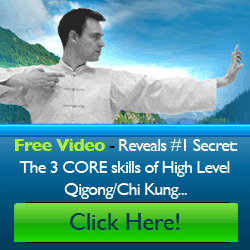 Now people can see the benefits of Qigong for the health and so it has developed for health as well. QM: Is the Qigong you learnt mostly moving or standing postures? Did you learn special breathing methods, or was it more natural?